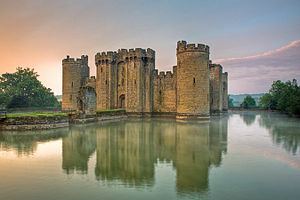 Bodiam Castle, England, fourteenth century. Medieval architecture is architecture common in the Middle Ages, and includes religious, civil, and military buildings. Styles include pre-Romanesque, Romanesque, and Gothic. While most of the surviving medieval architecture is to be seen in churches and castles, examples of civic and domestic architecture can be found throughout Europe, in manor houses, town halls, almshouses, bridges, and residential houses. Cloisters of Mont Saint-Michel, Normandy, France. Surviving examples of medieval secular architecture mainly served for defense. Castles and fortified walls provide the most notable remaining non-religious examples of medieval architecture. Windows gained a cross-shape for more than decorative purposes, they provided a perfect fit for a crossbowman to safely shoot at invaders from inside. Crenellated walls (battlements) provided shelters for archers on the roofs to hide behind when not shooting invaders. While much of the surviving medieval architecture is either religious or military, examples of civic and even domestic architecture can be found throughout Europe. Examples include manor houses, town halls, almshouses and bridges, but also residential houses. Early medieval secular architecture in pre-romanesque Spain: the palace of Santa María del Naranco, c.850. European architecture in the Early Middle Ages may be divided into Early Christian, Romanesque architecture, Russian church architecture, Norse Architecture, Pre-Romanesque, including Merovingian, Carolingian, Ottonian, and Asturian. While these terms are problematic,[why?] they nonetheless serve adequately as entries into the era. Considerations that enter into histories of each period include Trachtenberg's "historicising" and "modernising" elements, Italian versus northern, Spanish, and Byzantine elements, and especially the religious and political maneuverings between kings, popes, and various ecclesiastic officials. Romanesque, prevalent in medieval Europe during the 11th and 12th centuries, was the first pan-European style since Roman Imperial Architecture and examples are found in every part of the continent. The term was not contemporary with the art it describes, but rather, is an invention of modern scholarship based on its similarity to Roman Architecture in forms and materials. Romanesque is characterized by a use of round or slightly pointed arches, barrel vaults, and cruciform piers supporting vaults. Romansque buildings are widely known throughout Europe. Fletcher, Banister; Cruickshank, Dan, Sir Banister Fletcher's a History of Architecture, Architectural Press, 20th edition, 1996 (first published 1896). ISBN 0-7506-2267-9. Cf. Part Two, Chapter 13. This page was last edited on 25 March 2019, at 07:22 (UTC).